Joins 48 O.D. scaffold tube standards end to end internally. 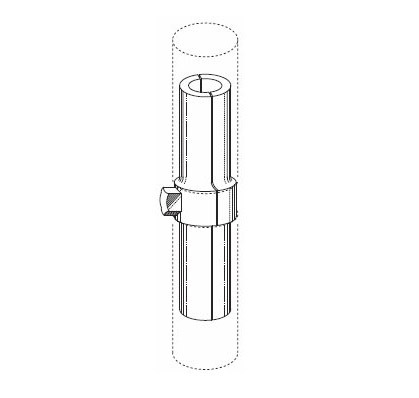 Expands to fit internal diameter of scaffold tube when bolt tightened. Tightening bolt suits standard Scaffold Spanner. Under compression loading this Joint Pin is capable of taking the full capacity of the scaffold tube. Not to be used for tension loads. Under tension loading, it is necessary to splice the joint with another scaffold tube and Swivel Couplers (tension load check required). Not to be used for end to end joining of tube ledgers. This Joint Pin must only be used to join scaffold tube with the same internal diameter, ie, the same wall thickness. 48.3mm O.D. x 40.3mm I.D. (4.00mm wall thickness tube) or – 48.3mm O.D. x 41.3mm I.D. (3.2mm wall thickness tube).